These are the remains of Horton's tabby house. 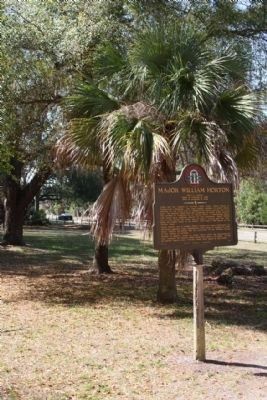 Major Horton of Oglethorpe's Regiment, the first English resident of Jekyll Island, erected on the north end of Jekyll a two-story dwelling and large barn. 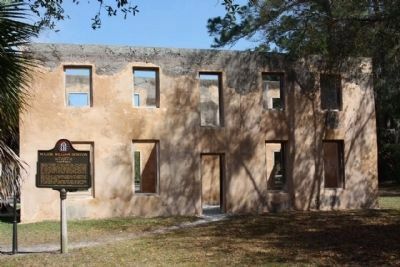 He cleared fields here for cultivation of crops which supplied the settlers at Frederica on St. Simons Island, a neighboring island, who would have suffered except for this assistance. 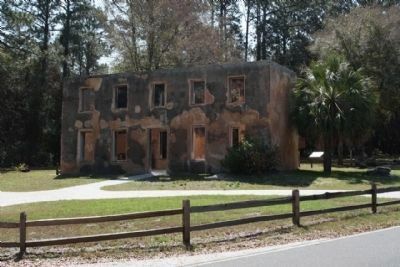 Major Horton cut a road across the north end of Jekyll, running east and west, from this tabby house to the beach. This road is still known as the Horton Road. 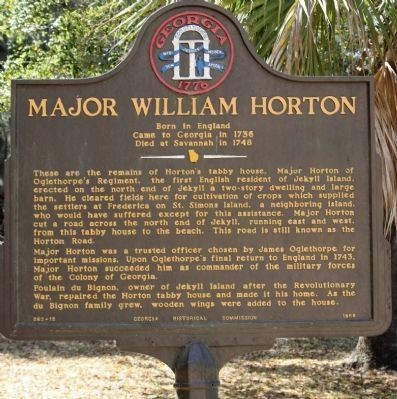 Major Horton was a trusted officer chosen by James Oglethorpe for important missions. Upon Oglethorpe's final return to England in 1743, Major Horton succeeded him as commander of the military forces of the Colony of Georgia. 2. Major William Horton Marker looking south along Riverview Dr. Location. 31° 6.103′ N, 81° 24.876′ W. Marker is in Jekyll Island, Georgia, in Glynn County. Marker is on Riverview Drive near Major Horton Drive, on the right when traveling north. Touch for map. Marker is in this post office area: Jekyll Island GA 31527, United States of America. Touch for directions. Other nearby markers. At least 8 other markers are within walking distance of this marker. Tabby (here, next to this marker); Horton House Historic Site (here, next to this marker); Poulain DuBignon and DuBignon Burying Ground (within shouting distance of this marker); Horton House Historical Site (within shouting distance of this marker); Horton House (within shouting distance of this marker); a different marker also named Horton House Historic Site (within shouting distance of this marker); Le Sieur Christophe Anne Poulain Du Bignon (about 300 feet away, measured in a direct line); a different marker also named Horton House Historical Site (about 300 feet away). Touch for a list and map of all markers in Jekyll Island. More. Search the internet for Major William Horton. Credits. This page was last revised on June 16, 2016. This page originally submitted on April 2, 2009, by Mike Stroud of Bluffton, South Carolina. This page has been viewed 1,293 times since then and 17 times this year. Photos: 1. submitted on April 2, 2009, by Mike Stroud of Bluffton, South Carolina. 2, 3, 4. submitted on April 3, 2009, by Mike Stroud of Bluffton, South Carolina. • Craig Swain was the editor who published this page.